Images of similar structures, the famous Pillars of Creation in the Eagle Nebula and formations in NGC 3603, were combined with the ones displayed here. 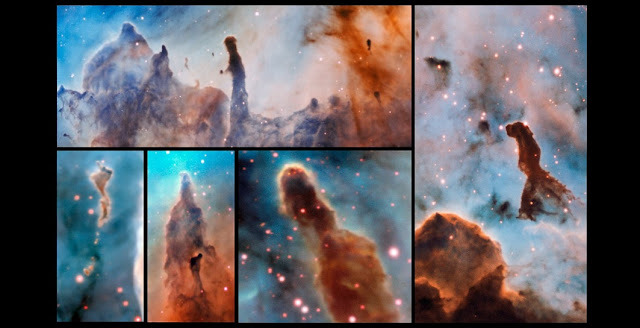 In total ten pillars have been observed, and in so doing a clear link was observed between the radiation emitted by nearby massive stars and the features of the pillars themselves. In an ironic twist, one of the first consequences of the formation of a massive star is that it starts to destroy the cloud from which it was born. The idea that massive stars will have a considerable effect on their surroundings is not new: such stars are known to blast out vast quantities of powerful, ionizing radiation — emission with enough energy to strip atoms of their orbiting electrons. However, it is very difficult to obtain observational evidence of the interplay between such stars and their surroundings. The team analysed the effect of this energetic radiation on the pillars: a process known as photoevaporation, when gas is ionized and then disperses away. By observing the results of photoevaporation — which included the loss of mass from the pillars — they were able to deduce the culprits. There was a clear correlation between the amount of ionizing radiation being emitted by nearby stars, and the dissipation of the pillars.